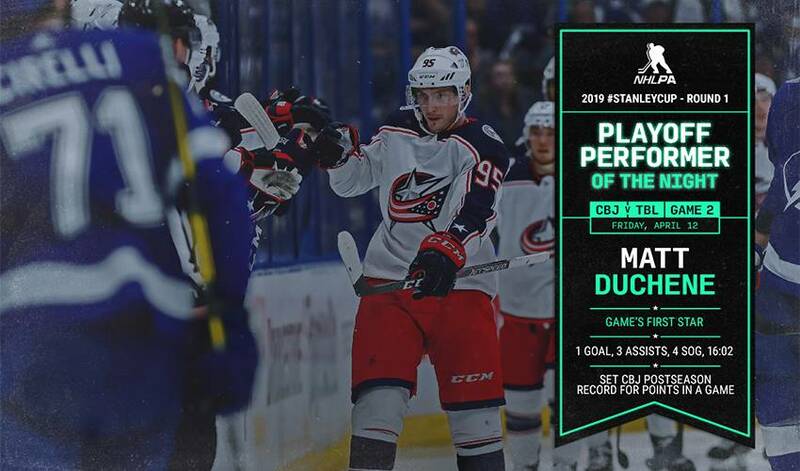 Matt Duchene had a goal and three assists as the Columbus Blue Jackets stunned the Tampa Bay Lightning 5-1 on Friday night to take a 2-0 first-round series lead. "It's half the wins that we need," Duchene said. "We're keeping our heads down and our eyes on the prize." "The regular season is different than the playoffs," Lightning coach Jon Cooper said. "Things just happen so fast. Alarms are going off. This is a five-alarm fire. But it's adversity and sometimes that's good that you have to go through stuff like this to see how we respond. One thing I do know about being with this group is, they find a way." It's likely that Kucherov will face discipline from the NHL. The league announced late Friday night that a hearing will be held Saturday regarding Kucherov's hit on Markus Nutivaara. "I'm not going to give you any thoughts on it," Columbus coach John Tortorella said. "It's self-explanatory." Tortorella said he's not surprised about the 2-0 series advantage even after the early hole in Game 1. "No, and I'm serious about that," Tortorella said. "I think we're a good team. We've gone through a lot as a team. If we're going to be successful as a team, we have to play as a team. So, even when we were down 3-0, I don't think we got away as far as how we have to play." Duchene assisted on both of Columbus' goals during the first period and put the Blue Jackets ahead 3-0 on the power play when the centre scored on the rebound at 1:28 of the second after Vasilevskiy had stopped his tip-in try. Tampa Bay's top-ranked power-play unit has failed in all five opportunities in in the series. The Lightning got within two goals at 3-1 when Sergachev's shot went into the net off Nutivaara's skate five minutes into the third. But, Nash and Panarin scored goals over a three-minute span midway through the period. Bobrovsky stopped Kucherov's shot and got a piece of Steven Stamkos' scoring chance that also went off the crossbar during an early second-period power play. "We're better than we're executing," Stamkos said. "There's no sense in pouting right now. We have to find a way to win." NOTES: Duchene's four points set a team playoff record. ...The Lightning outscored Columbus 17-3 in sweeping all three games between the teams in the regular season. ... Tampa Bay D Anton Stralman (lower-body injury) sat out his third consecutive game, but took part in the morning skate. Cooper is non-committal about when Stralman will be back. ... Lightning RW Ryan Callahan and D Braydon Coburn were healthy scratches for the second straight game. ... Tampa Bay scored 325 goals in 2018-19, the most by any team in 23 years.